Many different serotypes or genotypes of Infectious Bronchitis Virus are recognized. In general, different serotypes of the virus do not cross&dash;protect. However, some strains of the virus are quite effective at inducing cross protection against other serotypes and are referred to as protectotypes. Electron micrograph of Infectious Bronchitis virus particles Cook, J.K.A. &lpar;1983&rpar;. Isolation of a new serotype of infectious bronchitis&dash;like virus from chickens in England. Veterinary Record, 112, 104&dash;105. 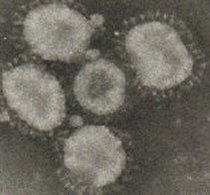 Isolates of IBV have been divided into different serotypes based on the virus neutralization test in embryonated eggs or tracheal organ cultures. IB isolates can also be identified molecularly using RT&dash;PCR and the RFLP test or nucleotide sequencing. This groups strains according to their genotype. Although serotyping and genotyping do not always give exactly the same groupings of strains, in general these is good correlation between the two typing methods. Many different serotypes or genotypes of IBV are recognized and they are important because in general, different serotypes of the virus do not cross&dash;protect. However, some strains of the virus are quite effective at inducing cross protection against other serotypes or genotypes &lpar;see protectotypes&rpar;. IBV has the ability to change rapidly. This can result in new variant viruses or serotypes. The prevalence of variant Infectious Bronchitis &lpar;IB&rpar; serotypes must first be determined before contemplating the use of a vaccine containing these viruses. Local regulations should also be taken into account. Variant viruses may be present when “IB&dash;like” problems are seen in flocks properly vaccinated with Massachusetts type vaccines. On the other hand, existing vaccines may represent the protectotype needed in order to get protection against the variant strain. When currently available products prove to give insufficient protection against an emerging virus, the development of a homologous vaccine against the new variant is justified &lpar;for example IBV 4/91&rpar;. IB variant D1466, a strain belonging to the D212 serotype, is of particular importance because it behaves somewhat differently from other important IBVs. It was first reported in the Netherlands in the 1960s, but it was not then associated with major disease outbreaks and was considered to be less important that other IB variants reported at that time. Molecular analysis of the S1 spike of the virus genome has shown that D1466 is the least related genetically of the known IB variants. This is confirmed by protection studies which show that little cross protection is provided by heterologous vaccines. However, since the early 1990s there was evidence of an increased incidence of disease problems associated with D1466 and some indication that these new isolates may have increased in virulence. In a recent IB survey, D1466 was found throughout most of western Europe &lpar;except Spain&rpar; and its incidence in some countries, including Germany, Belgium and the Netherlands appeared to be increasing. For example, almost 16&percnt; of samples tested from the Netherlands in 2006 were of the D1466 type. Importantly, on many occasions, it has been associated with poor egg production in both layers and broiler breeders. Following the emergence of D1466 in the Netherlands in the 1960s, a live and inactivated D1466 vaccine was developed for use in breeders and layers. The inactivated vaccine continues to be used, but currently no live attenuated D1466 vaccine is available to help control the disease outbreaks caused by D1466. Worthington, K. J., Currie, R. J. W. & Jones, R.C. &lpar;2008&rpar;. A reverse transcriptase-polymerase chain reaction survey of infectious bronchitis virus genotypes in Western Europe from 2002 to 2006. Avian Pathology, 37, 274&dash;257. New serotypes may emerge as a result of small changes in amino acid sequence of the S1 gene of the virus spike. Although it appears to be a new serotype, most of the viral genome remains unchanged. This may be the reason why the IB vaccines of a specific serotype can protect against strains of IB not belonging to the same serotype. From a practical point of view is more relevant to think in terms of protectotypes that serotypes. Studies have shown that vaccinating with two different types of IBV vaccine can provide broad protection against different IBV types &lpar;Cook et al. Avian Path. 28&colon;477&dash;485, 1999&rpar;. The best combination of vaccines was reported to be MA5 at 1&dash;day of age followed by 4&sol;91 at 14 –days of age. Since 4&sol;91 vaccine is not allowed in the USA, different combinations of vaccines with MA5 are currently being tested. It is clear from this work that the breath of protection provided by these different vaccine combinations does not protect against all variant IB viruses. Nonetheless, identifying these so called protectotype vaccine combinations is an area of active research. Read more in Cross protection &dash; live vaccines and Cross protection &dash; inactivated vaccines. There are different ways to measure protection against IBV infection. clinical signs in the birds. virus detection &lpar;for example, Immunofluorescence test &dash;IFT&rpar;. histological changes in the trachea or nasal tissue &lpar;for example by using monoclonal antibodies in immunochemical assays&rpar;. detection of the viral genome by RT&dash;PCR. For the purpose of our work we will refer basically to the ciliostasis test.